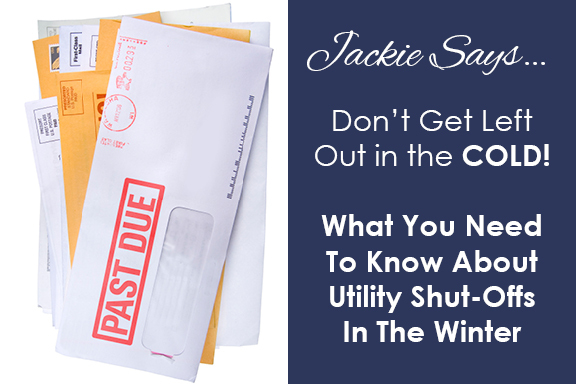 Don't Get Left in the Cold by Winter Utility Shut-Offs! Wintertime can be costly. It begins with all the expenses of the Holidays, and then all it takes is a run of extra cold days to blow your budget. Fortunately there are laws that can protect you if you are unable to pay your utility bills. Know your rights and you’ll never get left out in the cold. The Board of Public Utilities has laid out a list of basic consumer rights to which every one of us is entitled. Utilities are required to provide a copy of them to you and they’re required to follow them, but the tricky part is that when you’re talking to a customer service rep about an overdue bill – they’re not required to make it easy. The first thing to do when you can’t pay is to get yourself organized. Have all the information on your overdue balance and payment history available and make sure that your name is on the bill. You might not have had your name on the bill previously due to an old roommate or worries about your credit when you signed up, but if you’re the one who lives with the consequences if the power or heat goes off, you need your name on there. Your own financial hardships are what will determine your eligibility for help and you’ll only qualify for help if the bill is your own. Most companies have a policy allowing you to add your name whether there’s a balance or not. Once you’re on the phone with your utility, know that you have the right to negotiate a payment plan you can afford. If you owe $300 and they say they need $200, that’s not the final word on what will keep your heat on. They are required to make a good faith effort to work with you and they can’t require a deposit payment over 25% of what you owe. From that point on, you have an obligation to follow through with the agreed upon payments or else you may still be shut off – unless . . . If you have a hardship or are a part of certain government programs, your utilities absolutely cannot be shut off between November 15th and March 15th thanks to the Winter Termination Program. Even if you were previously shut off, you can get your utilities turned back on after November 15th as long as you make a good faith payment. Qualifying hardships include unemployment, illness, medical bills and deaths in the family. Qualifying government programs include Lifeline Utility Assistance, Low Income Home Energy Assistance Program, Work First New Jersey/Temporary Assistance to Needy Families, Supplemental Security Income, Pharmaceutical Assistance to the Aged and Disabled, Work First NJ/General Assistance and the Universal Service Fund. Customers protected by the Winter Termination Program still need to make a good faith effort to pay a budget plan – if possible – and to turn over any government heating assistance money. What many people don’t know is that a similar program applies during periods of excessive heat in the Summer. If you’re in one of the categories qualified for protection in the Winter, your electric may not be shut off during a period where temperatures are predicted to exceed 95 Degrees in the following 48 hours. You’ll still owe them money for the power you use, but while it’s broiling outside you’ll still be able to have air conditioning, fans and refrigeration. Medical emergencies are a special category of protection that applies year-round. Your service may not be discontinued for non-payment if doing so would aggravate a medical condition and if you can prove that you cannot pay. You’ll need a doctor’s note and this can be used to keep lights and heat on for a period of up to 60 days. After that, if there’s still a medical emergency, your doctor can renew his/her certification of your status. Additionally, while your status is pending, the Board of Public utilities and your utility provider may delay shutoffs.